Comparing a top-of-the-range Swift Kon-Tiki with an entry-level Sundance may seem a bit of a strange thing do – a bit like comparing apples with oranges if you like. But the idea is to demonstrate how it is still possible to get a brand new Swift motorhome with good equipment levels for under £38,000. Although the Kon-Tiki is competitively priced, we aim to prove that more budget-conscious buyers can aspire to elements of Kon-Tiki quality and style for a fraction of the cost. Here, we compare two superficially similar motorhomes from the same stable: a Sundance 630L (at £37,760) and a Kon-Tiki 645 (at £50,970). A £13,000 difference. Externally, both motorhomes look good and at first glance there’s actually little in their appearance to tell them apart. Each warrants a fully colour-coded cab (no unpainted bumpers even for the Sundance), complete with electric windows and door mirrors, central locking, a driver’s airbag and a full set of concertina-type cab blinds. Look closer and you’ll see the visual differences between the two. The Kon-Tiki boasts silver-painted sidewalls, flush-fit windows (the one in the habitation entrance door opens, too), super-stylish and modern rear elevation and alloy wheels. The Sundance sidewalls are of a plainer white hue and the rear elevation is noticeably more sober with a simple quartet of low-set oval lights. In basic terms, the two motorhomes seem to have an awful lot in common, with their twin lounges, all-in-one washrooms and cheerful demeanour, but once again, closer examination shows where the Kon-Tiki buyer gets more for his or her greater outlay, but conversely shows where those with smaller budgets are saving their money. 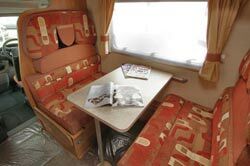 Up front, the differences between the two seem pretty obvious: the Kon-Tiki sports a pair of small settees – one forward-facing, one inward-facing – where the Sundance warrants a proper, if more formal, pullman dinette. 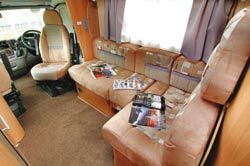 But the Kon-Tiki’s aforementioned lounge is actually in travel-seat mode; you can, in fact, convert it quickly and easily into a full L-shaped affair, simply by adding an extra base panel and a couple of cushion infills. 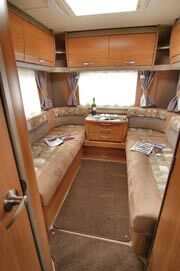 It makes the forward part of the motorhome look and feel much more relaxed and upmarket. The Sundance’s cab chairs don’t swivel because of the close proximity of the pullman area. Of course, the Kon-Tiki is aimed more at couples, and the Sundance more at families, so the appeal or otherwise of each comes purely down to personal choice. 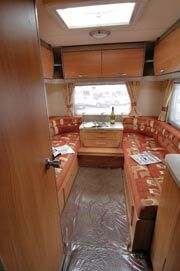 The Kon-Tiki gets a better-equipped kitchen and out back, the two motorhomes’ shared end-lounge layouts seem little different to one another. But the level of lighting in the Kon-Tiki is noticeably better and its dedicated TV station more convenient in design. Bed making is easier in the Kon-Tiki, both models get Swift’s space-saving side washroom (though the Kon-Tiki gets a quasi-separate integrated shower cubicle) and the more expensive model also gets a superior heating and boiler system. The Kon-Tiki is a flagship motorhome that positively bristles with the latest technology, the best chassis in the business and a kit list as long as your arm. If, however, you just don’t have the extra £13,000 (over a Sundance 630L), then we think you’ll be pleasantly surprised by the cheaper motorhome. 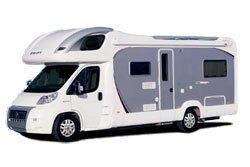 *Motorhome Insurance cost based on 2008 Swift Kon-Tiki 645 valued at £50,970. Fitted with manufacturers immobiliser, Phantom Proactive Tracking device and Thatcham Category 1 alarm, kept at home at SN4 7DP. Motorhome owners – professionals over 50 years old with no claims, convictions or health conditions in last 3 years. 4 years no claims bonus mirrored from car policy and 2 years motorhome driving experience. Members of motorhome club doing less than 7000 miles annually. £250 excess applies. European cover £19 extra, European Breakdown £42 extra. Premium includes insurance premium tax at 5% and is correct as of 11/09/08. 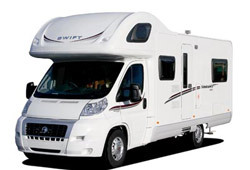 **Motorhome Insurance cost based on 2008 Swift Sundance 630L valued at £37,760. Fitted with manufacturers immobiliser and Thatcham Category 1 alarm, kept at home at SN4 7DP. Motorhome owners – professionals over 50 years old with no claims, convictions or health conditions in last 3 years. 4 years no claims bonus mirrored from car policy and 2 years motorhome driving experience. Members of motorhome club doing less than 7000 miles annually. £250 excess applies. European cover £22 extra, European Breakdown £42 extra. Premium includes insurance premium tax at 5% and is correct as of 11/09/08.